FC Bayern Munich and FC Dallas have today announced a comprehensive partnership, the first of its kind, that will offer players within their professional academies a pathway to soccer both in the United States and Germany. The European powerhouse and founding Major League Soccer Member will come together to exchange talent, allowing young players to experience different coaching styles and settings to enhance their development. "The United States is home to our very first international office, highlighting our commitment to engaging and growing FC Bayern's fan base in the Americas", commented FC Bayern Munich's Executive Board Member for Internationalization and Strategy, Jörg Wacker. "Our intention from the beginning has been to help support the growth of soccer in the U.S., supporting the existing development of players. For us FC Dallas is the ideal partner", he added. The top-flight clubs will collaborate on coaching, exchanging expertise that helped develop national team players, including Thomas Müller, Mats Hummels, Bastian Schweinsteiger and Kellyn Acosta. Opportunities will also be created for the youngsters to play fixtures against one another in their respective countries. 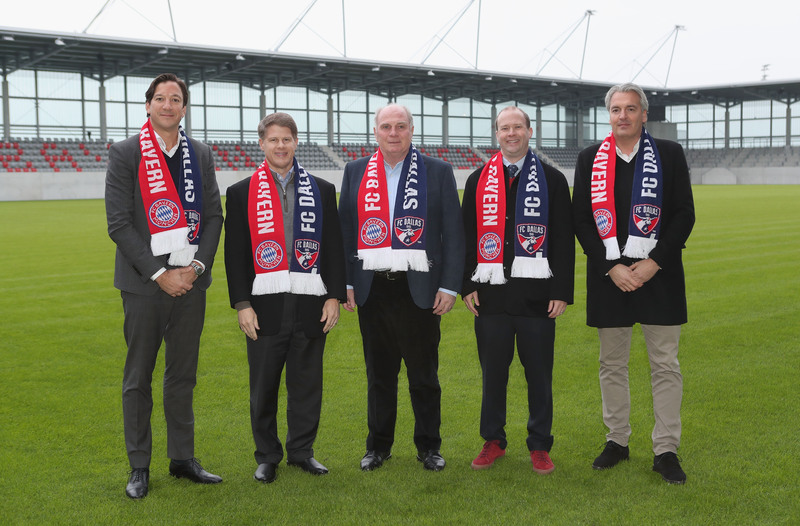 "We are thrilled to join FC Bayern Munich in this groundbreaking collaboration," said FC Dallas chairman and CEO Clark Hunt. "One of our primary goals is to develop an academy and a club that can compete at the highest level on a global scale. This unprecedented partnership with one of the most successful clubs in the world marks a significant step toward that goal, and we look forward to working closely with the outstanding leadership at FC Bayern". Twenty FC Dallas academy players have signed for the club's first team, the highest number in Major League Soccer with 10 players currently holding roster spots. In addition, at least 28 FC Dallas academy players have appeared with the youth national teams of the U.S., Canada, or Mexico. "This is a unique alliance between two historic teams at the forefront of youth development," commented FC Bayern Munich's President of the Americas, Rudolf Vidal. "We are proud to announce this partnership with FC Dallas, who have pioneered professional soccer in the U.S. Working with FC Dallas at this elite level will complement the extensive grassroots infrastructure we have helped create over the last few years in North America," he added.